Dentures are prosthetic devices to replace missing and damaged teeth. You can say them a conventional set of ‘false teeth’. These are a solid set of teeth embedded in a soft gum-like structure. They are easy to fix in and take out. Generally, people after the age of 70, use these dentures as their gum get loose with the teeth, eventually not being able to support the tooth. Dentures proved to be a blessing for those who have completely lost their teeth as they can work just like the natural teeth to chew and bite things easily, helping them to enjoy their favorite meal. At present there are custom designed dentures available in the market which can be used by anyone regardless of the structure and size of their mouth as they can fix in perfectly in anyone’s mouth. Dentures are actually made of porcelain or plastic. At present, they are made out of hard resin. The soft gum like structure is made of resin or flexible polymer and because of such soft material, it is easy to fix dentures on the natural gum-line. Talking about the types of dentures, the market is equipped with their different types according to the convenience of people. Here we have described the major types of dentures that are drastically used nowadays. Partial Dentures: Partial dentures are used in case when you have some of your teeth missing. In such case other teeth are not able to support the whole structure. These types of dentures easily fit in the part where the teeth are missing and can be removed easily when not in use such as while sleeping. Partial dentures provide strong support to the gum-line as well as other teeth, preventing them not to fall out from their place. 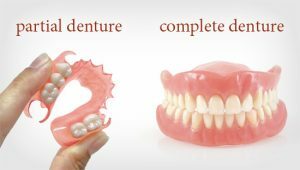 Complete Dentures : Complete dentures are used when you have a complete set of teeth missing. One can use the upper half or the lower half dentures that are fixed in place by either by suction or by using adhesive. They can also be removed easily when needed. Immediate Dentures : These types of dentures are used after the extraction of a natural tooth and hence been called immediate dentures. They are created before the teeth are being removed and are fixed on the place temporarily during the healing process. Immediate dentures are disposed off after the healing process and are replaced with permanent dentures. Over Dentures : In case if traditional dentures are not suiting the mouth, these type of dentures are used. They are fitted over the roots of natural teeth. They are mostly used in cases when there are no natural teeth in the set. 1- It improves your smile by providing a sound structure to your mouth and supporting your cheekbone and lips, that matters a lot. 2- It helps you to chew and bite easily so that you can enjoy your food just like you did with your natural teeth. 3- They are vital solution of missing and damaged teeth. In some cases when teeth are severely causing serious pain and other oral issues and hence need to be removed. Dentures can fill up there space easily and make your smile better. They are strong and beautiful alternatives to weak and damaged teeth that are no longer helpful to eat your favorite meal. You Can Consult with Dr. Mansi Patel For your Partial or Fix Dentures. Its good to have consultation with your dental expert instead of a lab assistant. Partial & fix denture specialist in ahmedabad Gujarat India.